In 1989, the executive board of the American Hellenic Educational Center, of what was later to become Camp Angelos, initiated an aggressive capital development program at the Sandy River Property. The program, crucial to the future success of the camp, drew support from throughout the community. This support in turn was due in no small part to the personal and financial commitment given the program by Dr. William J. Angelos. 'Doc' Angelos was a Portland native - born, raised and educated in this area. He graduated Pre-Med from the University of Portland in 1942. Like many of his generation, his education was interrupted with the outbreak of WWII. He served in the U.S. Army from 1942 until 1944. 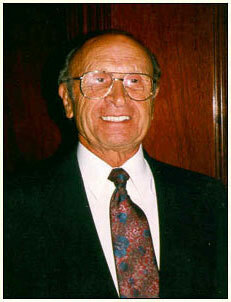 Upon his return, he resumed and completed his studies at the University of Oregon earning his DMD degree in 1946. Just as his practice was getting established, the conflict in Korea broke out. Demonstrating once again a willingness to serve, he returned to the Army for two more years of active duty. In 1954, he came home to successfully work his Portland-area practice for another 43 years, before retiring in 1997. Throughout that period, he did not break character with patterns he had earlier established. He served a variety of causes and organizations with his time, energy and resources. The camp became a key focus of Doc's attention during the past decade and has benefited greatly from his generosity - all the way from his support of the original development program years ago to his work on the executive board. Dr. Angelos is survived by his wife Geri, and 4 daughters from his first marriage (Alice-deceased 1981) Emily, Marsha, Gaylene and Joyce, and 4 grandchildren. Websystem hosting provided by WolfPk.